Setting up and running a lemonade stand is a summertime right of passage for many young entrepreneurs. It's a fun activity for young friends to do together and to stay entertained on a hot summer day. 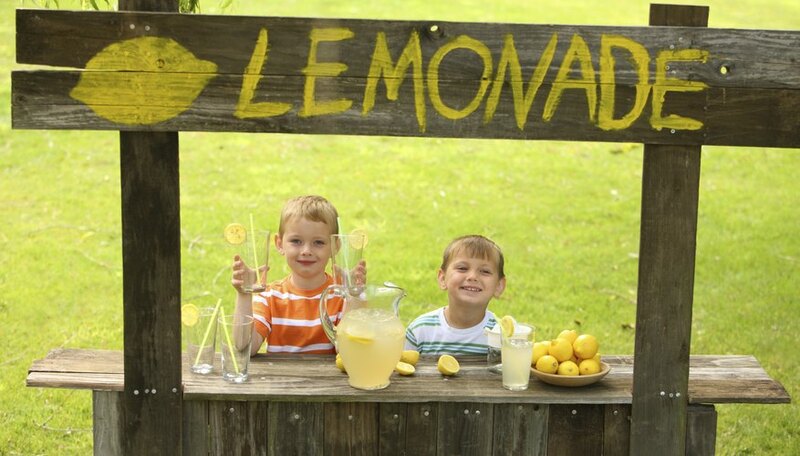 Running a lemonade stand also teaches teamwork, math, direction following and customer-service skills. Stand facing the side of the cardboard box that you want to be the front of your lemonade stand. Keep in mind the top and bottom are the sides with the flaps. Use the box cutter to remove the front side of the cardboard box. Your lemonade stand now has a top, a bottom, a back and two sides. Reinforce the inside of the cardboard box at the top, bottom and sides with the duct tape by running a length of duct tape across the flaps at the top and bottom. Also, smooth a length of duct tape into the crease between the top and side walls and again at the bottom crease between the "floor" and the walls. Paint the outside of the cardboard lemonade stand with your bright-colored paint and let dry. Use the black paint to create a sign on both sides of your lemonade stand so everyone knows what you're selling and how much it costs. Be sure to paint the lettering very large so your customers can read it from the end of the block. Place the lemonade stand at the end of your driveway or at the edge of the sidewalk and position the small bookshelf or shoe rack inside. Put the pitchers of lemonade on the top shelf and the cups on the next shelf. Display any other merchandise you'd like to sell. Set a few chairs for "employees" next to the lemonade stand. If you have a little table and a few more chairs you could set them up for customers to enjoy your lemonade. Now it looks like you have a storefront with a sidewalk cafe.